The visitor centre at Attenborough is now open. For a list of activities and events than look at this site. Beckingham Marshes is a major habitat creation project on the River Trent floodplain. Information about the country park plus lots of info about the surrounding area, Rise Park, Top Valley, Bestwood Village etc. Daily updates on Birding sites around Doncastor including the Idle Washlands. An excellent site about birds and insects in the village of Eakring which is in central Nottinghamshire. New website to discuss and promote the extensive wildlife rich area of the Erewash Valley on the Derbyshire/Nottinghamshire border. They are a small charity managed by its Trustees. Their main aim is to maintain and develop the country park for recreation and education for the whole community. The RSPB, working in partnership with Lafarge Tarmac to restore a sand and gravel quarry on the River Trent into the biggest reedbed in the East Midlands. Get excellent views of the Peregrine nest at Nottingham Trent University. Staff at Brackenhurst College have been busy installing web cameras in bird boxes and erecting them around the campus. Nottinghamshire Biodiversity Action Group is a partnership of voluntary, statutory and community groups working together to conserve and enhance the wildlife of Nottinghamshire to the benefit of people. A local site that is dedicated to the awareness of Barn Owls and to conserve and increase the population of Barn Owls in Rushcliffe. Right in the heart of England you’ll find the Sherwood Forest Futurescape; a mosaic of ancient woodland, heathlands, acidic grasslands, river corridors, man-made lakes and farmland. The Trent and Tame River Valleys Futurescape includes rivers, farmland and wetlands, as well as the green spaces and gardens of communities living alongside these iconic waterways. The place for all reported sightings from Lincs, Notts, Leics & Rutland. Our counterpart in Derbyshire. What's on and What's seen in Derbyshire. Aims are to promote the study, conservation and enjoyment of birds and birding in Leicestershire and Rutland. Take a look at this web site, brilliant. Probably the best bird club web site there is. Well laid out, full of information about Lincolnshire birds, lots of articles to read. (formerly the Ogston Hide Group) was formed in 1969 to fill a gap in the Derbyshire bird scene. It is intended to be run as informally as possible whilst still meeting the needs of birdwatchers across the ornithological spectrum. Rutland Water is a most important winter wildfowl sanctuary. During the last three summers, young Ospreys have been brought to Rutland Water from Scotland. This web site gives background information on the natural history side of the reservoir. 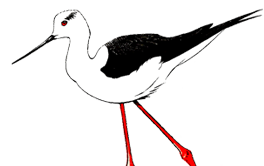 The SBSG is the leading ornithological society in Sheffield. The bird club for the four counties of Staffordshire, Warwickshire, Worcestershire and the Metropolitan West Midlands.